India 17 September 2016: Ginger is a common staple in most kitchen cabinets and has a lot of benefits. Ginger not only benefits your health but also for your hair too. For centuries ginger has been used in Ayurveda for treating hair problems. Here are a few benefits of ginger for hair. 1. Fresh Ginger roots are loaded with magnesium, potassium, phosphorous and vitamins which are needed to keep our hair healthy, strong and shiny. 2. 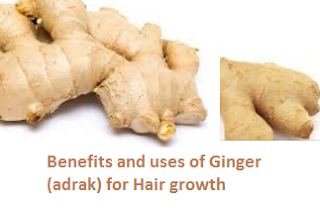 Ginger (adrak) makes your hair follicles strong, hence it has been used as a home remedy to stop hair fall for ages. 3. 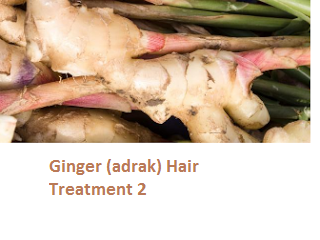 Ginger (adrak) has many antiseptic properties which help in getting rid of dandruff. Ginger oil is an age old home remedy to get rid of dandruff. Best way to use ginger to get rid of dandruff is to apply ginger oil along with olive oil on your scalp and let it work its magic overnight, and wash it the next day. 4. Ginger (adrak) is rich in vitamins, zinc and phosphorus which help in making your dry and brittle hair strong and shiny. Ginger naturally makes your scalp healthier and stronger, it also tends to boost your hair growth. 5. Ginger (adrak) increases blood circulation to the scalp, which strengthens and nourishes the hair follicles and promotes hair growth. 6. 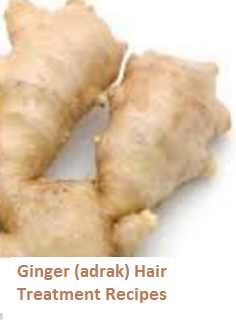 Ginger (adrak) is rich in fatty acids which moisturizes the hair. Ginger extracts make your hair stronger and reduce hair fall by strengthening the hair follicles. In a small mixing bowl mix both the ingredients well. Apply this mix on your scalp in circular motion. Massage your scalp using your fingertips for 5 minutes. Leave this mix on your scalp for 30 minutes. Finally rinse your hair using a mild shampoo. Take the ginger and peel it. Now in a blender blend the ginger with the water. Blend till it turns into a smooth pulp. Now take a muslin cloth and filter this puree. Apply this filtered puree on your scalp and let it sit there for 10 minutes. Rinse your hair using a mild shampoo.